“Year-round programming” was a recurring theme at this year’s network Upfront presentations — and our handy calendar of more than 80 June premieres and finales would seem to support that claim. 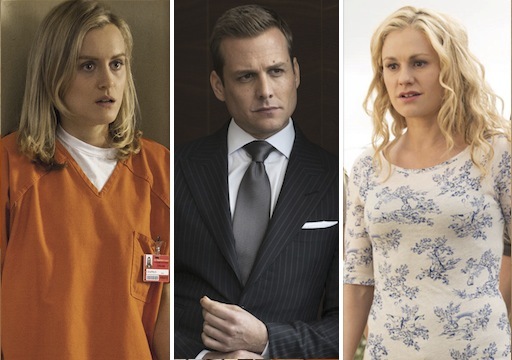 Among the returning shows, USA Suits back up, Orange Is the New Black serves another sentence, more Major Crimes are solved and True Blood bites into its final season. Brand-new fare includes FX’s Tyrant, HBO’s The Leftovers and a spin-off you may have heard about, Disney Channel’s Girl Meets World. RELATED |Cable Renewal Scorecard: What’s Coming Back? What’s Been Cancelled? Saying goodbye in June, you have Orphan Black (so soon! ), Game of Thrones and the series finales for Drop Dead Diva and Californication. As an added bonus, this calendar boasts not one but two tinted boxes previewing some discerningly curated July and August premieres. Finales are in BOLD. Click on the thumbnail below, and save the dates.